Mega Sale! Save 24% on the JUDYelc Professional LED 9 Head Bird Spider Lights New Bar Wedding DMX Moving Head Light Bar KTV DJ Disco Stage Beam Lighting by JUDYelc at IGWT. Hurry! Limited time offer. Offer valid only while supplies last. The stage light has 9 LED, every 3 LED on 1 line. Each LED providing solid color or multi-color beam, the light brings fantastic visual effect. The stage light has 9 LED, every 3 LED on 1 line. Each LED providing solid color or multi-color beam, the light brings fantastic visual effect. Supporting professional 16/48 channels, the light brings more choices to make your party joyful. Rotating and lighting with 9 beams, every 3 LED on 1 line. Each LED can provide solid color or multi-color beam that are toned by red, green, blue and white primary colors. Support DMX-512 control, sound control, master-slave mode, auto running. Bring fantastic visual effect for club, DJ show, home party, ballroom, KTV, etc. Note: This stage light can be used indoor only. ♫ Support professional 16/48 channels. ♫ Rotating and lighting with 9 beams, every 3 LED on 1 line. ♫ Support DMX-512 control, sound control, master-slave mode, auto running. 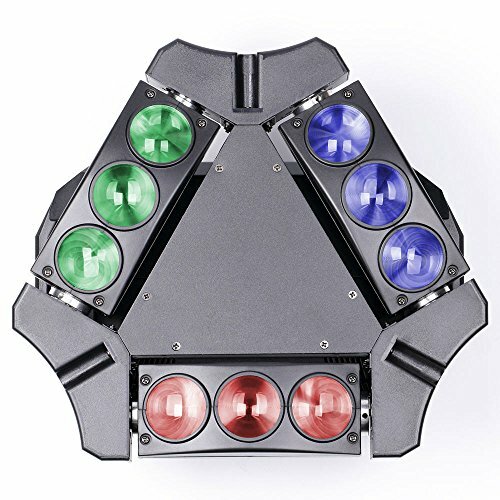 ♫ Each LED can provide solid color or multi-color beam that are toned by red, green, blue and white primary colors. If you have any questions about this product by JUDYelc, contact us by completing and submitting the form below. If you are looking for a specif part number, please include it with your message. American DJ Mega Flash DMX 800w DMX Strobe Light w/ Sound Sensor + Free Speaker!